This post combines two of the things that excited me most about making ice cream when I was given my ice cream maker for my birthday and subsequently bought The Perfect Scoop. First: Making Mint Choc Chip Ice Cream. My childhood favourite, almost always eaten at a particular friend's house. Those pale green scoops studded with chips and piled into bowls were heaven indeed. 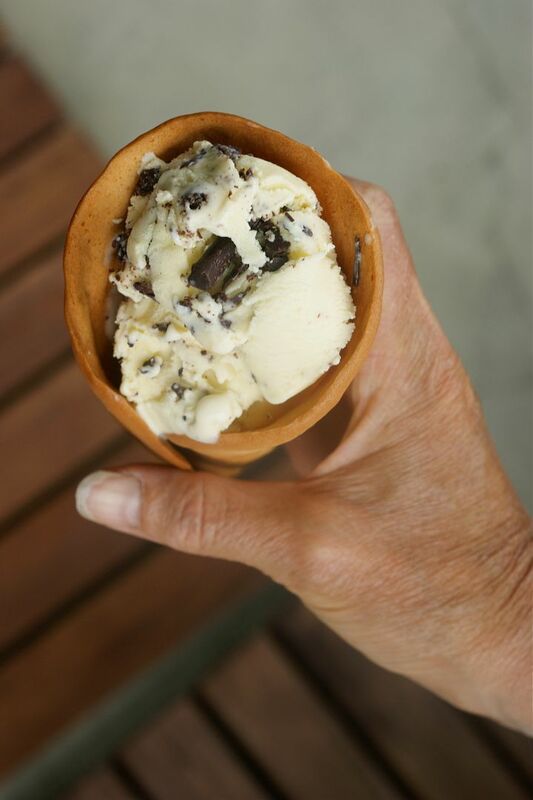 Second: One of the first things that I happened to come across in The Perfect Scoop was this recipe for homemade cones. 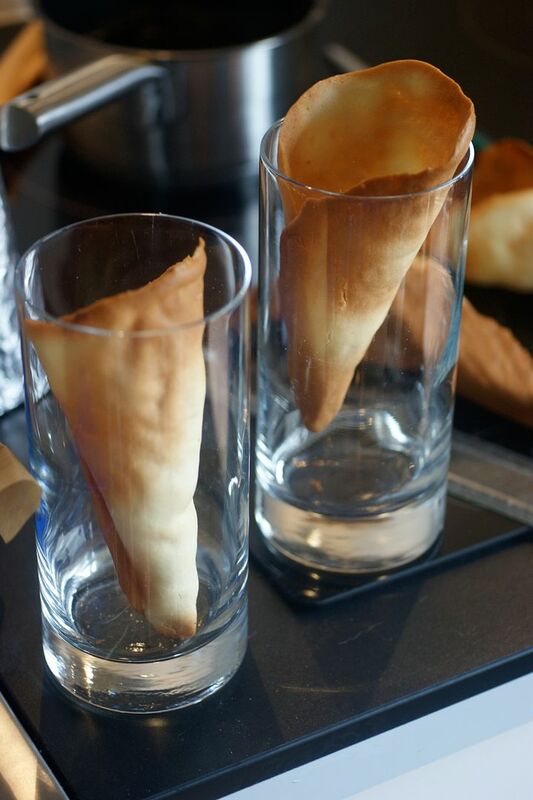 I had to make them - I love nice crisp biscuity cones. 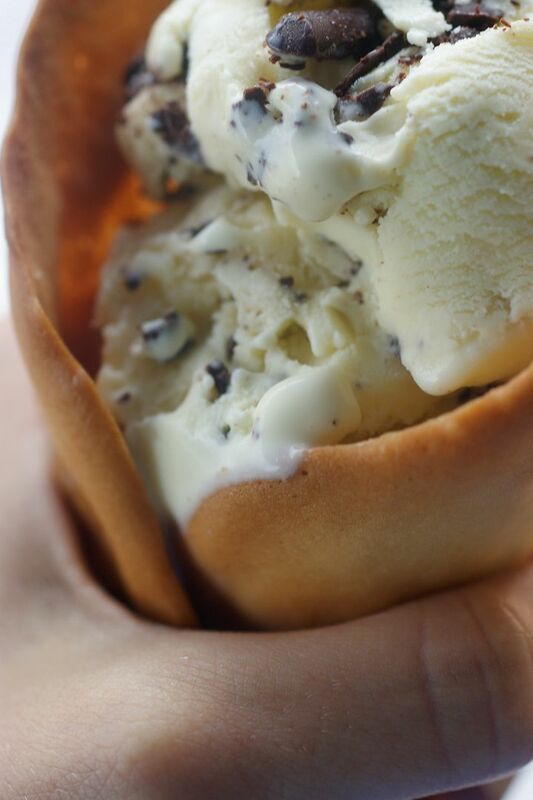 I've been searching for the mint/recipe to recreate this ice cream for ages. Much as I wanted to make ice cream out of the batch of mint that went towards this Blueberry Loaf with Lemon and Mint Syrup, I didn't have an ice cream maker then. 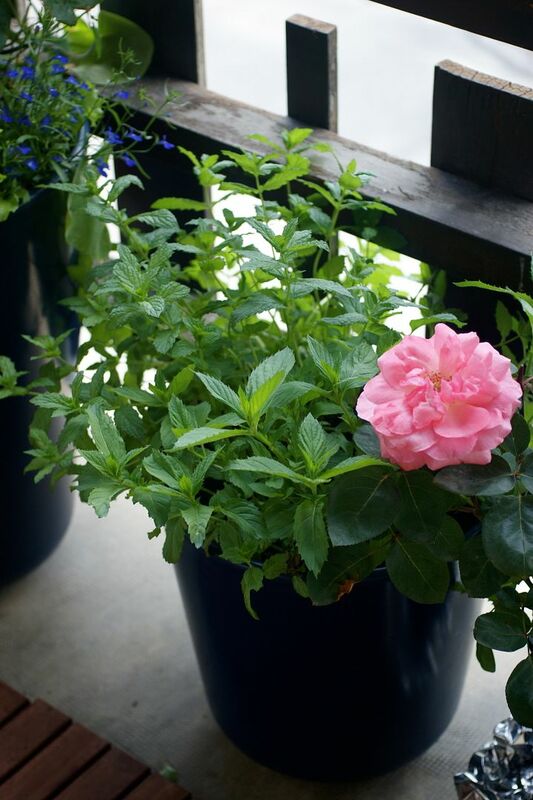 In the end, Mum bought several plants and potted them up for me and for her tea. There are many more scoops of ice cream left in this plant pot! Stirring the mint leaves into the cream mixture sounds like the rustling of petticoats. It's a beautiful sound. I have to admit - I made a blunder when making this ice cream. We had a few pots of the luscious thick cream that I love so much (see here for rhapsodising) and so I used that in place of normal pourable double cream. This leant an overly rich tone to the ice cream - you could almost taste the extra fat, even though I replaced some of the cream volume with milk. It's a shame - I'll remember next time - but it's still delicious. Just not as refreshing! 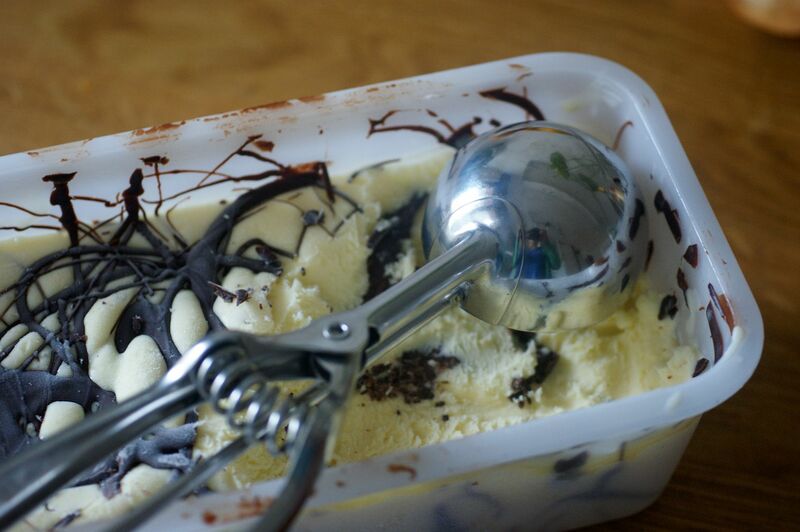 Instead of using chips, I used David's method for Stracciatella, which I repeat below, where you layer the ice cream with drizzled melted chocolate. This not only looks lovely, but creates a great effect when you scoop it. This morning I decided that the time had come to finally make my cones. 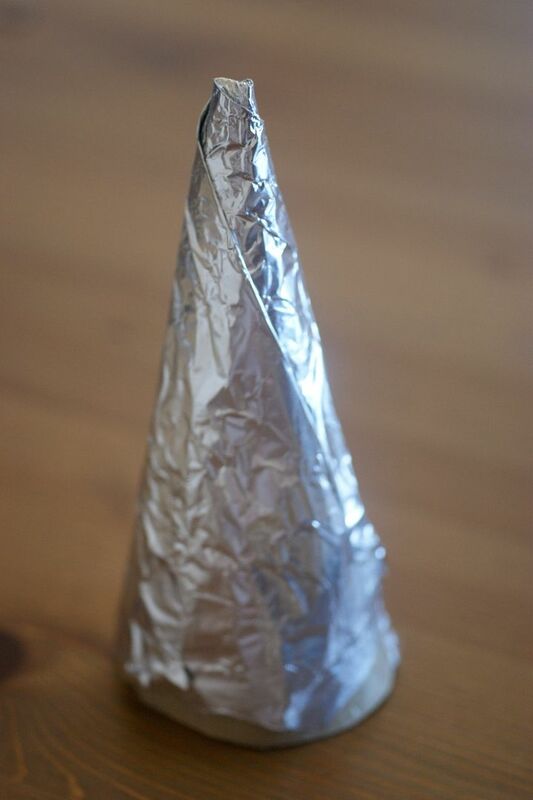 Then I re-read the recipe and remembered that I didn't have a cone mould - so I made one. Bring on the new thin cardboard Amazon packaging and tin foil! A cereal box would have worked just as well - I just cut a semicircle out then rolled it up and taped it. I love creating things like this at home. Making the cone batter is incredibly easy. Rolling the cones is not so easy. It took me most of the batch of six to get one to look right and I still need more practice. The cones are so tasty that I don't really mind - we ate the first failed two before the second two were out of the oven. These cones filled with my lovely fresh mint ice cream streaked with dark chocolate really hit the spot as Mum and I sat outside this afternoon, watching the world go by. Preheat the oven to 175C/350F. Melt the butter and put aside. In a medium sized bowl, stir the egg whites, sugar and vanilla together. Add the salt and 45g of the flour and beat in. Pour in the melted butter and mix well. Finally beat in the remaining flour. This batter will keep in the fridge for about 4 days. Line a baking sheet with greaseproof paper. 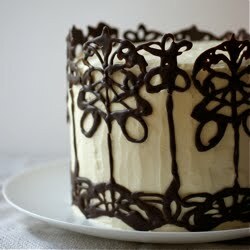 Put 2 level tablespoons of batter onto the paper and spread with a spatula/spoon/palette knife into a 6"/15cm circle. Try to keep it as level and smooth as possible. On the other side of the baking sheet, repeat so you have two circles. Put into the oven for 10-15 minutes, depending on your oven - mine took about 12. When done, they should be mainly a deep golden brown, often with some lighter spots. While they cook, assemble the thing you'll need to roll them: your conical mould, two tall glasses and probably some clean rubber gloves to protect your hands from the heat. When they're done quickly remove from the oven and place on a heatproof surface. Use a thin (metal) spatula under one of the discs and flip it over. Immediately begin rolling the disc around the mould - position the point of the mould a few mm from the bottom of the circle and wrap each side around. Press down onto the surface on the seam and pinch the bottom. When it has cooled slightly, place upright in one of the glasses. I found I then needed to return the other circle to the oven to heat up again. Repeat the process. When ready to try the next two cones, take the parchment off the hot baking sheet to spread the discs - the heat stops them spreading properly. When totally cool, put in an airtight container until you want to use them. Put the milk, sugar, salt and 250ml of the double cream together in a saucepan. Whisk together and heat until hot to touch. Stir in the mint leaves the cover with a lid and remove from the heat. Let the mixture steep for about an hour at room temperature. Strain the mixture into another medium saucepan. Really press the leaves to make sure you get as much flavour out as possible, then discard them. Pour the rest of the cream into a medium-large bowl and set the strainer over it. Prepare an ice bath and set this bowl in it. In another bowl, lightly whisk the egg yolks together and put the bowl close to the stove. Put the mint mixture in the saucepan back on the heat until warm - when it is ready, slowly pour about half of it into the yolks, whisking constantly. Return this yolky mixture to the pan and whisk together. Heat again, stirring constantly (use a spatula to make sure nothing sticks to the bottom), until the mixture thickens to a custard consistency and coats the back of a spoon. Pour the contents of the pan through the strainer into the bowl with the cream. Mix together and set over the ice bath. Stir until cool, then refrigerate for at least 4 hours or overnight before churning. 100g good quality dark chocolate. While the mixture is churning, melt the chocolate. 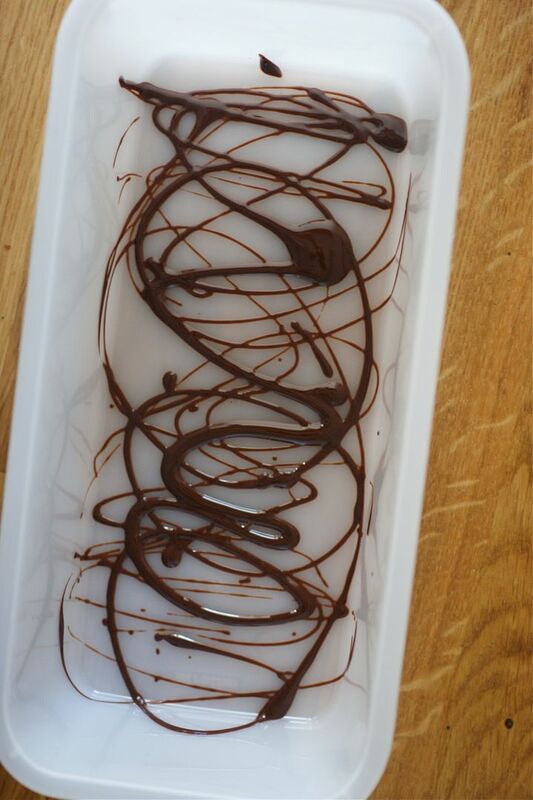 Prepare a clean box for the mixture to freeze in and then drizzle some of the chocolate off a spoon onto the bottom of the box. When the mixture has finished churning, spread about 1/3 of the ice cream over the bottom of the container and then drizzle again. Spread another 1/3 over and drizzle again, then repeat for the last bit of ice cream. Stir lightly to break it up a bit and then top with any remaining chocolate. (You can also pour a thin stream of the melted chocolate into the spout of your ice cream maker at the last minute before you stop it). Very impressing that you even made your own cones! I made some mint chocolate chip ice cream the other day. It was eaten before I could take some pictures and post it on my blog. You beat me to it! I've been eyeing that very recipe - looks fabulous, I'll have to try it soon. Can't wait to try this! They look delicious. 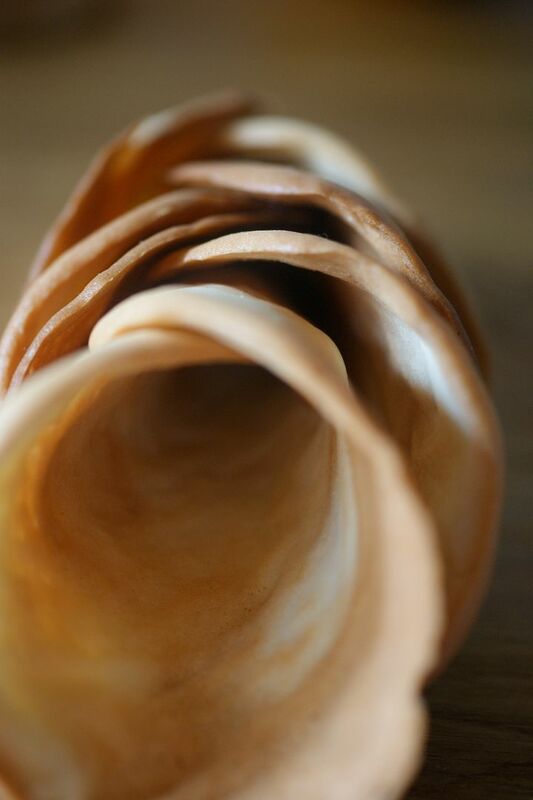 I have always wanted to try to make my own cones but was never brave enough, you encouraged me! Ooh wow you even made your own cones!! This looks deliicous, mint choc chip is one of my fave flavours of ice cream! Wow! 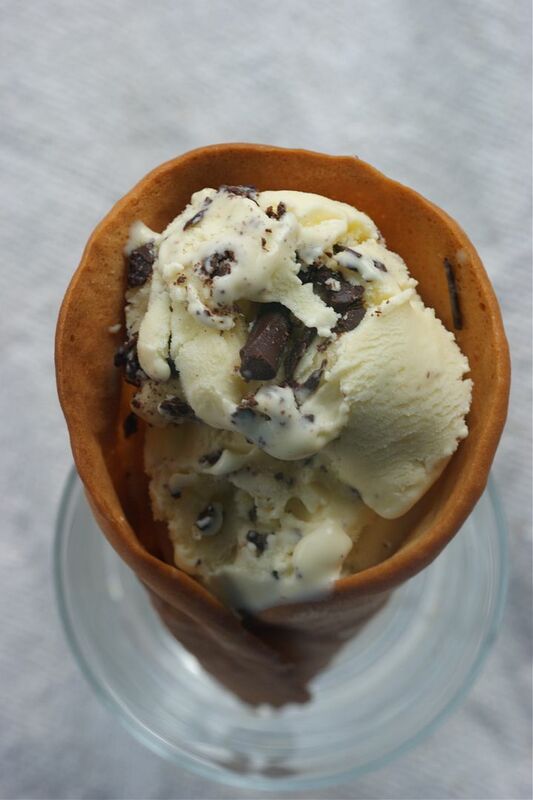 I was just thinking about two days ago about making my own cones! Now I'm definitely doing it. Good job! yum !!!!!!!!!!!!!!!!!! was it hard to make ?? This looks ABSOLUTELY delicious! I was just wondering whether you could recommend an ice cream maker? Online reviews seem so mixed! I never did a huge amount of research as my friends bought mine for my birthday. Mine is a magimix le glacier 1.1 ltr and it's always been great. Hope you enjoy it when you get it! Just tried making both the mint ice cream and cones. Don't know how you didn't burn your fingers making the cones, but you're right - they taste delicious. Also, it's been fun reading your blog. Love your food pics! whollykao.com - Glad you liked the recipes and the blog :) I think I rolled them with rubber gloves on to try and help with the heat. Hi, I was wondering what type of mint you used/ would recommend for the ice cream. Sounds like most say peppermint is the way to go but harder to find than spearmint. Does it make a big difference? Thanks! Hi Monica - I used peppermint here - my mum drinks it in tea. I guess it's just personal taste - I prefer the flavour of peppermint and it's easier to find here. If you like spearmint then I don't see why it wouldn't be lovely!